Direct Reading Attenuator with R.C. DAXE Millimeter-Wave Direct Reading Attenuator is a measurement instrument for signal level setting or loss measurements in waveguide networks. 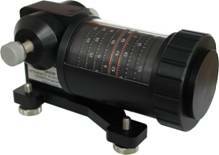 It also can be used for calibration of other attenuation measurement instruments. Direct Reading Attenuators have rotary-vane design. The value of attenuation is determined by rotation angle of resistive film with respect to the waveguide channel. Attenuation value does not depend on of frequency. The Attenuators are provided in waveguide bands between 18 GHz and 225 GHz. A is attenuation in dB.